Contour for structure. Highlight to enhance. A sculpted, V-shaped face, now in an easy glide! 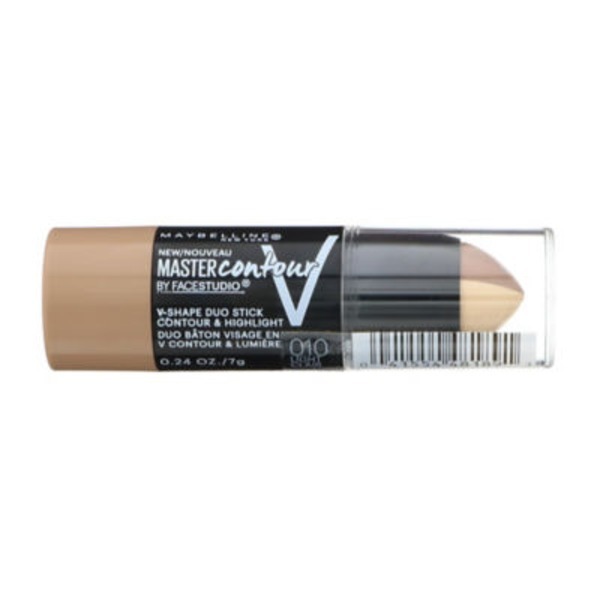 Master the perfect V-shaped face with this easy-to-use contouring and highlighting duo. This 2-in-1 stick creates the illusion of structure and lift in two easy steps. G985546 Ingredients: Ethylhexyl Palmitate, Polyethylene, Methyl Methacrylate Crosspolymer, Hydrogenated Polyisobutene, Phenyl Trimethicone, Nylon-12, Diisostearyl Malate, Silica, Ozokerite, Bis-Diglyceryl Polyacyladipate-2, Aqua / Water / Eau, Zinc Pca, Propylene Carbonate, Caprylyl Glycol, Disteardimonium Hectorite, Tocopherol, Tocopheryl Acetate, Pentaerythrityl Tetra-Di-T-Butyl Hydroxyhydrocinnamate, [+/- May Contain / Peut Contenir Ci 77491, Ci 77492, Ci 77499 / Iron Oxides, Ci 77891 / Titanium Dioxide, Mica] F.I.L. D182414/1. Step 1. Apply dark shade along the jawline and hallows of the cheeks and blend well. , Step 2. Apply light shade to the high points of the face, like the tops of cheeks and bridge of nose, and blend well.